Okay, so this is my first time doing this, and it looks totally fun. So, let’s see if I get this right. I have to tell you, I work pretty hard to avoid historical fiction. No offense meant toward historical fiction writers or readers. It’s just not my thing. Maybe it was because I sucked at history in school? Not really sure, but it just doesn’t seem to have enough action to hold my attention. How ’bout you? Which genre do you avoid at all costs? I have a “follow by email” option on the right sidebar, so feel free to sign up. We have a lot of fun here talking movies, music, books, and…well, random things. 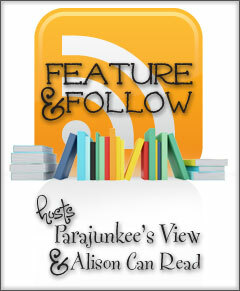 This entry was posted in Uncategorized and tagged Alison Can Read, Catch the Rush, Feature and Follow, Lynn Rush, Parajunkee, Paranormal Romance, Urban Fantasy by Lynn Rush. Bookmark the permalink. i want to exchange link with you if you intrested plase contact me.. There is a lot of historical fiction that I wouldn’t be able to read. I’ve written it, but I can easily see how it would only appeal to a segment of the YA readership. This looks like a fun blog hop! Oddly popular choice!! I must’ve bumped into a few good ones, or something! I’m following Twitter as @BurgandyIce and Networked blogs as Laura Armstrong. Have a GREAT weekend!!! To be honest I’ve never read a historical fiction novel. It’s just that those books set in different eras because I feel like I can’t relate to the characters. Hi, Tabitha!!!!! Yeah, it’s the “relating to the characters” issue I have, too!! Hey, thanks for stopping by!!!! Romances. (Big surprise, huh> Ironically I’ve downloaded a few of my blogger buddy’s books and they are romances.) I don’t do westerns, either. I’m not a fan of westerns either…they kinda fall under historical. LOL! Hi, Sam. I know, right? But I sure see a lot of it out there, especially in the bookstore I work in! 🙂 THANKS for coming by! Hi, Ali! Thanks. This is a fun hop!!! 🙂 Thanks for swinging by! Thanks, Vanya!!!!!! Yeah, I’m seeing quite a few aren’t Historical Fiction fans. LOL!!!! 🙂 Thanks for coming by.